Train Your Way to Maximum Performance! You want to work up to a higher weight - but how are you going to do it? A bar and repetitions just aren't going to cut it if you're after superior performance. It's time to show yourself some love and train like never before! 44SPORT introduces Fractional Weight Plates, the Pair of 1.25 Pound All Black Steel Technique Weights! Great for learning and practicing techniques, this Fractional Micro Plates provides the ultimate low weights great for for Personal Records and Progressive Overload Training. If you are training for weightlifting, powerlifting, gymnastics, or any physical activity requiring a warm up, this Weight Plates is especially suitable for gyms where continuing progression is a priority. This is the best steel weights for all of your needs! And there´s much more! This Fractional Weights allow for small incremental jumps and progressive overload training. From overloading as trainee or advanced, even you'll start to feel impressed by your consistent progression! Perfect for weight lifting, or use in calisthenics training areas. Ideal for technique and skill work, this pair of black technique Plates helps you develop movement patterns and work up to higher weight for your Olympic lifts. The secret to 44SPORT´ success is in our superior designs. No imitations means no busting or breaking. Just resilient, black steel, 1.25 Pound weight Plates for your gym! Why Choose Our Fractional Weight Plates? Try Today and Overload Your Performance! Order Your Fractional Weights Now and Overload your Training. 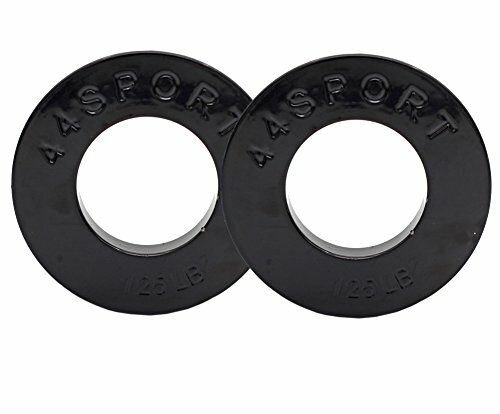 OLYMPIC FRACTIONAL PLATES: Pair set of 1.25lbs / .567 kg Solid all powder-coated Steel weights, for toughness and durability. HIGH QUALITY: Standard sized for standard 2¨ Olympic bars, 17.5" outer diameter. Make weight increases in as little as 2.5 lb increments. IMPROVES TECHNIQUE: Use to learn and practice technique for deadlifts, olympic lifts, cleans, snatches and more. 100% QUALITY: With the 44SPORT Fractional Plates Weight Sets you get tremendous flexibility for all strength levels. Try this today and overload your strength.